This DIY was written by me and originally posted on a now defunct site called Holidash, it was added to Not Martha in February of 2014. The instructions as they originally appeared as well as one addition and extra notes are below. Wondering about what to make Mom for Mother’s Day? I’ve been thinking about traditional gifts like flower corsages and lockets, and I decided to combine the two. 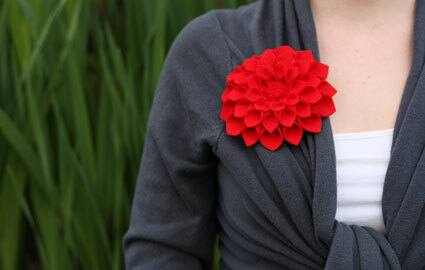 This felt dahlia pin has a secret pocket in the back that can hold a picture or message for your favorite mom. We’ll be cutting out a bunch individual petals, and above I show what I think is the most efficient way to divide up your sheet of felt. 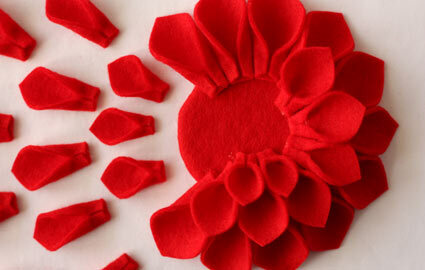 First cut a 3.25 inch diameter circle from your flower color felt. (Do this first to make sure you don’t leave yourself too small a scrap at the end.) Then cut three 1.5 inch strips, two 1.25 inch strips and one 1 inch strip of felt. 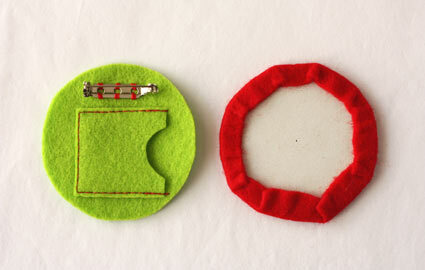 In the contrasting color (here, the green), cut a 2 inch diameter circle and a 1.25 inch square. Cut a small indent into the square. Finally, cut a 2 inch diameter circle from your cardboard. 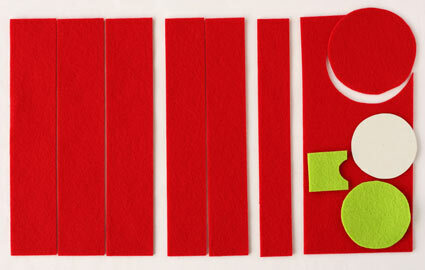 Now cut your flower color strips into 1.5, 1.25 and 1 inch squares respectively. 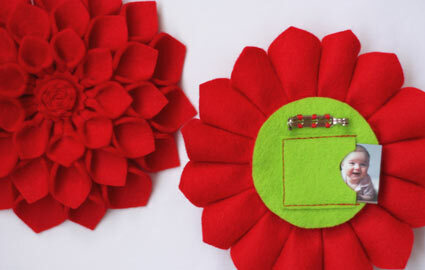 If you need more petals you can use the bit of leftover felt to cut more squares. I ended up needing fifteen 1.5 inch petals, thirteen 1.25 inch petals and nine 1 inch petals, you might find you need more or fewer to fill in the flower. 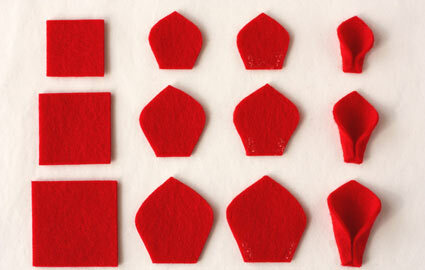 To form the petals cut each square into a rounded petal shape, with a wide base and a pointed tip as shown above. Put dots of glue in the lower corners and fold each side over so that they meet in the middle. This is the most frustrating part of the project — the glue can take a while to set and if you don’t hold the petal shapes in place they will pop open. I found this to be true for both the wool felt and the polyester felt I tested. I made a few versions using felt from various sources and found the higher quality wool felt to be a bit thicker, which meant that it took longer to set, but the colors were richer so I was willing to wait. 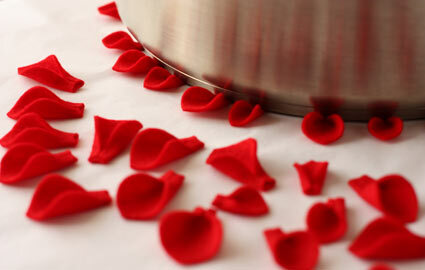 I used clothespins or a heavy stainless steel skillet to hold my folded petals down while they dried, as shown above. Luckily, the Fabri-tac adhesive won’t bond to the metal of the skillet, so you don’t have to worry about petals stuck to your pan. While the petals are setting you can prepare the back of the flower. Glue the cardboard circle to the center of the 3.25 inch flower color felt circle. Then dab glue on the overhanging part of the felt and fold it over the edges of the cardboard, wrapping it around to the back. You might need to put a saucepan on top to weigh it down while it sets. This will be the base for the petals, and the folded edges on the back will be covered by your contrasting felt circle at the very end. Now grab your contrasting felt square and circle. Position the square at the bottom of the circle and stitch it around three sides to make a small pocket that opens to the side, leaving enough room at the top of the circle to attach the pin. You can put a few small dabs of glue on the pin before you hand stitch it into place at the top of the circle. I used contrasting thread that matched my flower, but you can use whatever thread color you’d like. When the petals are set, it’s time to glue them to the flower color base. Glue the 1.5 inch petals around the edge of the base, positioning them in about 1/4 inch. As you work be sure to snug the base of the petals as close together side by side as you can; the more you can fit on the base, the more dramatic the results. Next, glue a row of the 1.25 inch petals about 1/4 inch further in towards the center of your pin. Do the same with the 1 inch petals, leaving about a 1 inch circle in the middle. To finish the center of the flower cut a 1 inch circle from the remaining flower color felt using the pinking sheers, or cut a wavy edge with scissors. 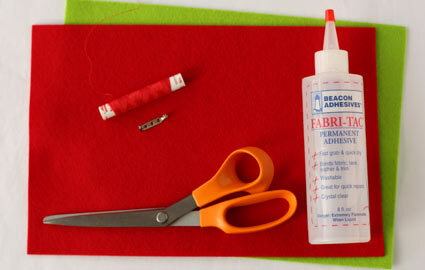 Also use the pinking sheers to cut a thin strip from the felt; you can cut two strips if you think you’ll need them. 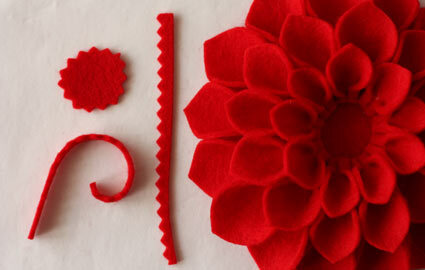 Glue down the small circle in the center of your flower to cover the ends of the smallest petals. Then curl the thin strip into a tight spiral and glue that to the very center. All that is left to do is to glue the contrasting colored backing to the back of the flower, covering the back of the cardboard, and find a picture — or write a little note — small enough to slip into the secret pocket. Then wrap it up and present it to Mom! Note: the below appeared as a separate post here on Not Martha, I’m adding it to the project page so that it’s all in one spot. I made one a while back. I still love it and it permanently resides on the lapel of one of my work suit jackets. I made a couple a while back. my comment may exist elsewhere on the site, but I glued mine with contact cement so I’d never have to hold them shut while the glue sets (you allow the glue to set open, and then pinch it closed after and it sticks well instantly.) I then tacked the petals in place, also with contact cement, and then machine stitched it all. I had to carefully cut spikey bits for the centre by hand, being unable to find pinking shears in the timeframe I needed. I think I recall that you remarked that you thought contact cement would be heavy, but I have no basis for comparison. Beautiful! 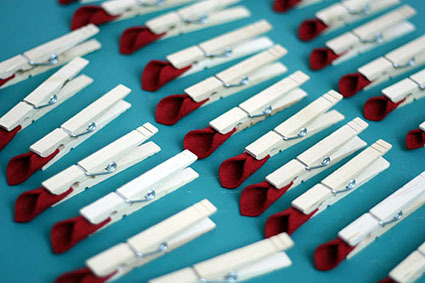 I wonder if you could staple the petals, so that you don’t need all those clothespins and waiting time. Just what I was looking for. Great tutorial. This was my first felt flower, and it turned out amazing! Thanks so much! These are truly beautiful! Inspiring, thanks for sharing this post! These dahlias are fabulous ! can’t wait to make one/some tomorrow if the weather is too wet to garden ! I saw your mom last week – she was wearing a gorgeous red-felted flower pin. I commented on how pretty it looked and she told me that you made it and about your web site. I was so happy to find the instructions. Thank you! Thanks for the instructions. I hope to adapt it for use for a top for a bed, maybe one or maybe several of different sizes. Thinks! Beautiful Flowers! Fabulous Tutorial!! Two questions: How big are the finished flowers and approximately how time does it take to make one? Thanks a Ton! I made about 16 of these for favors for my bridesmaids/mothers/aunts at my wedding. I used staples to create the petals and hot glued them into place. You can’t see the staples at all in the finished product and they are not heavy from the glue. I also used Victorian-motif buttons for centers, which turned out very nicely.